Ground to Level I:53,50,37,39,42,51.Level I to Level II:37,21,30,25,25,35.Level II to Level III:29,23,17,19,11,17.Level III to Level IV:11,5,7,3,4,9.The archaeologist recorded the numbers on four hexagonal pieces of paper and pinned them at the center to form the model shown below. He realized that although all the assistants visited the staircases in clockwise order, they did not all start from the same side. The total number of steps altogether is 600, so the archaeologist thought that there must be 100 steps on each side. 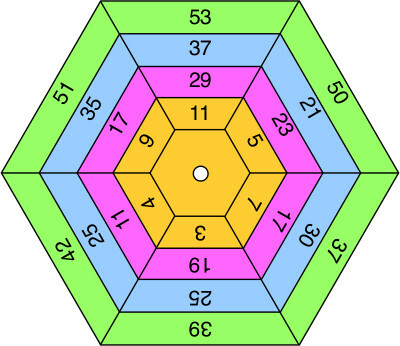 Rotate the levels so that as many of the six sides as possible have exactly 100 steps. An old puzzle revived by RGee Watkins, Hemet, California.